According to the poet's notes, the poem was inspired by an exhibition at London's National Gallery from 2011 called "Dislocations," where surviving fragments of various great works of art were on display. The first stanza describes a fragment of a marble sculpture of a crouching lion or lioness--only a paw and a bit of flank remains--not enough to determine its gender. However, the observer may fill in the blanks with his or her imagination ("image to absence to memory"), and thus recreate in his or her mind what the lion(ess) might have looked like. In the second stanza and into the third, the poet wonders if a Renaissance painter from "across the room" in the exhibit would have recreated the lion(ess) differently, filling in the background or what the animal may have seen from its perspective, for example. A fragment of a painting of St. Jerome by that artist is also on display. The remainder of the poem describes this fragment and the evidence that it did not adorn a church alter but more likely a sacristy cupboard. The final stanza remarks how x-ray studies of the painting reveal that the original depiction of St. Jerome underneath the surface paint is two lines crossing each other--the symbol of Christianity within the saint. 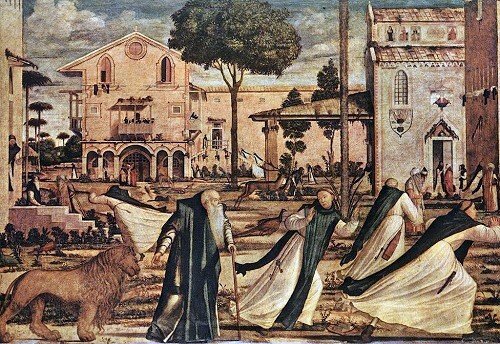 Then, tying the story of the sculpture fragment and the painting of St. Jerome together nicely, the poem ends with "umber brought the lion to him," as God did according to legend. New Poem: "Wake Up, America!" New Poem: "Fog and Friction"
New Flash Piece: "All That Shimmers"